Now, the powerflex website doesn't list these for the 986. But it shows the same part number for non adjustable inner bushes for both models, so would these fit a 986? In other words, are the inner control arm bushes the same on both models? This seems like a great way to achieve camber adjustability for sensible money. My concern is that you probably need a lot more camber than a device like this is likely to provide. If you're looking for a cheaper solution than adjustable LCA's, I'd recommend camber plates which will allow about -1.75 to -2.0 degrees (total) on the stock suspension. At $475 plus installation they are the best affordable route to more negative camber. 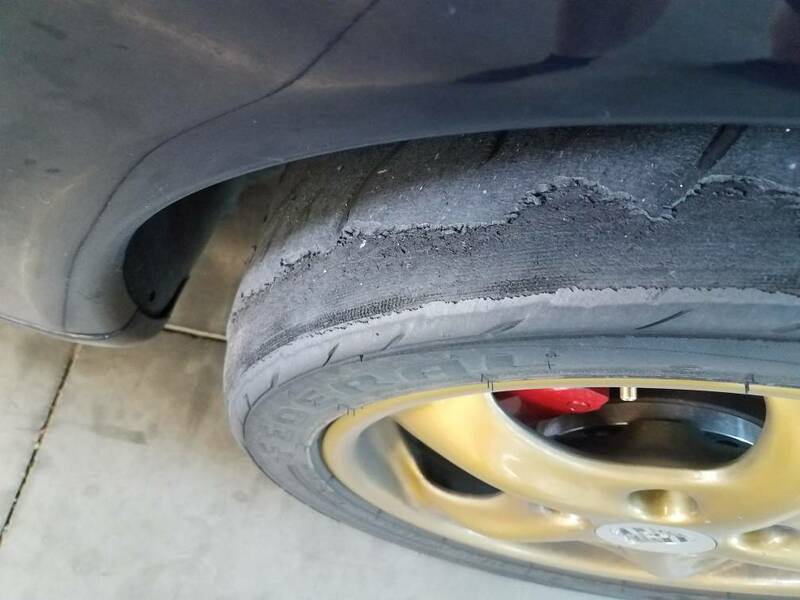 But the camber plates alone won't get you to an optimal -2.5 to -2.75 degrees of camber but its a good start (this is based on handling quality alone; this much camber for a car that never see a track might not be optimal for other factors like tire wear). Its all a trade off. Camber Plates and Monoballs-Rennline, Inc.
Last edited by thstone; 12-18-2012 at 08:57 PM. I've just spoken to Powerflex and they checked the measurements for me and said they were pretty sure that it would fit a 986. He said the bushes would provide minimum of an extra degree of camber adjustability. Wouldn't that allow at least -2 overall? You can get at least -1 with the standard suspension arms, no? I agree -2.5 would be an ideal compromise. But if I could get it to -2 total with these bushes, I settle for that given the significant cost savings even compared with camber plates. The Boxster suspension (mostly the fixed ride height) will limit the amount of negative camber that can be acheived regardless of the amount of camber adjustability in the camber plates or adjustable LCA's. I had adjustabe LCA's with my stock suspension and the best that I could get was -1.75 to -2.0 deg. With the ride height adjustable PSS9 shocks and the LCA's, I can get over -3.0 now if I want. Stock suspension typically max's out at -0.75 to -1.0 deg. Camber plates add another -1.0 deg for a total of about -2.0. Of course, these numbers can vary by about 0.25 deg so when you're planning on getting -2.0 deg, you might only get -1.75 or as high as -2.25. There's not much to be lost by trying the adjustable bushings except a small bit of money and the installation time/cost. If you want, give them a try and let us know what happens. OK, thanks. The bushes will be combined with some kind of suspension change. Probably fully adjustable coilovers, so from what you've said I think I should be able to achieve at least -2, which is fine. Anything more will be treated as a bonus. I'll report back as and when I have any further info! It's not clear to me how these bushes are held from rotating in the end of the arm. If they can rotate then how does it hold the camber setting? Old thread, but a new question: why would someone want to get camber adjustable LCA's rather than just leave the car stock? Is it likely that they want to track the car? 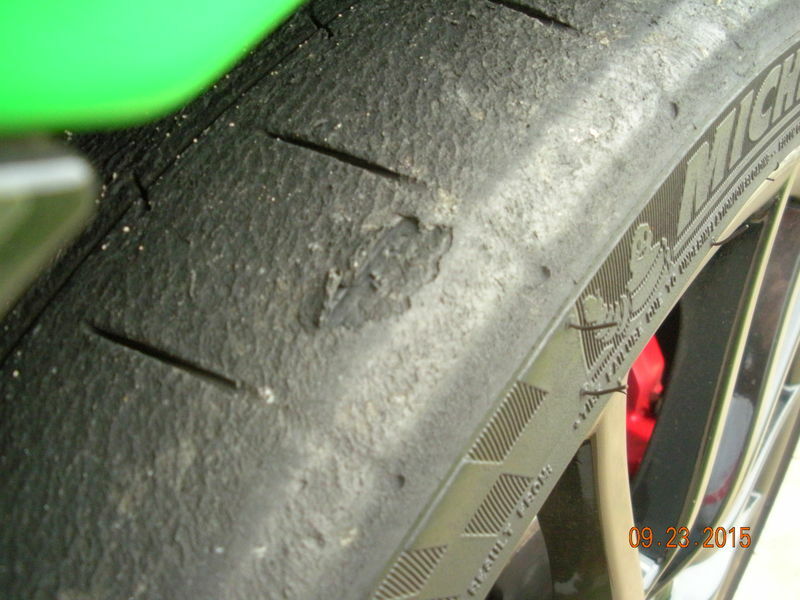 Is camber adjustable on a stock 987.1? Old thread, but a new question: why would someone want to get camber adjustable LCA's rather than just leave the car stock? With a stock suspension, you can get around -1 degree max of camber in the front, and in back, you can get around -1.8-1.9 max in back. Is it likely that they want to track the car? Unless they are a tuner looking for the "stanced" look, the reason to want more neg camber in the front is most likely for track driving. -1 is OK at first when someone is starting out, but when they get faster, it really puts a beating on the outer edge of those front tires during turning. 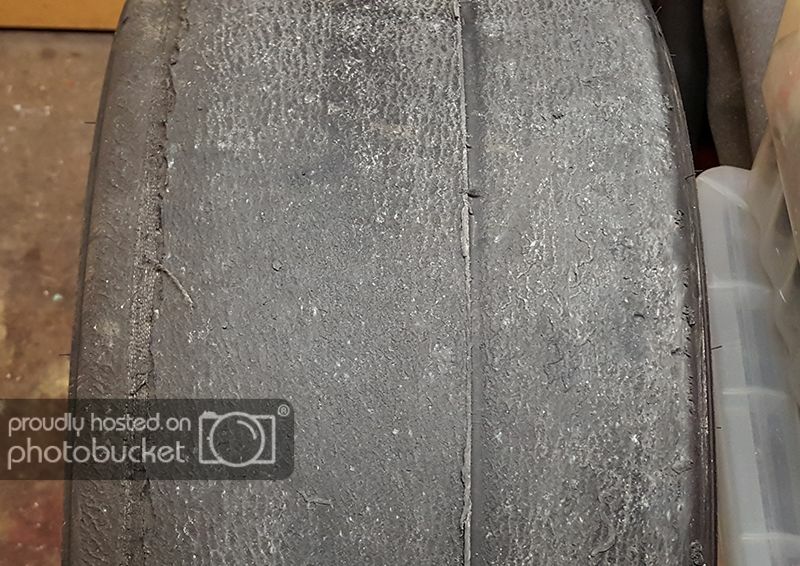 More neg camber helps to maximize the contact patch of the front tires, giving more grip, but also distributing the load evenly on the face of the tire and not just on that outer edge... Otherwise you can really shread those edges and ruin the tire, while there is still plenty of tread left everywhere else on the tire. Thank you for that excellent explanation, Steved0x. ....it really puts a beating on the outer edge of those front tires during turning..... Otherwise you can really shread those edges and ruin the tire, while there is still plenty of tread left everywhere else on the tire. I now have GT3 LCAs on my CSS. -2.5 front, -2.1 rear (stock). Before I had the LCAs, I had std alignment. 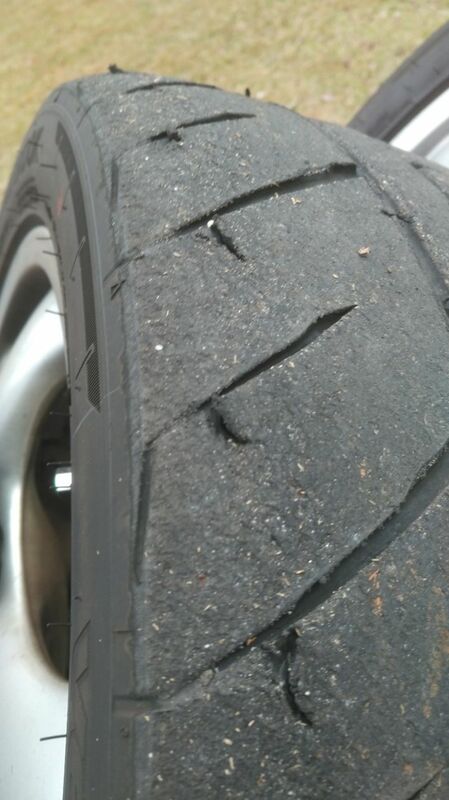 Here's what my tires looked like with that alignment. Surprisingly enough, the insides of my tires are not too bad now with all the neg camber. 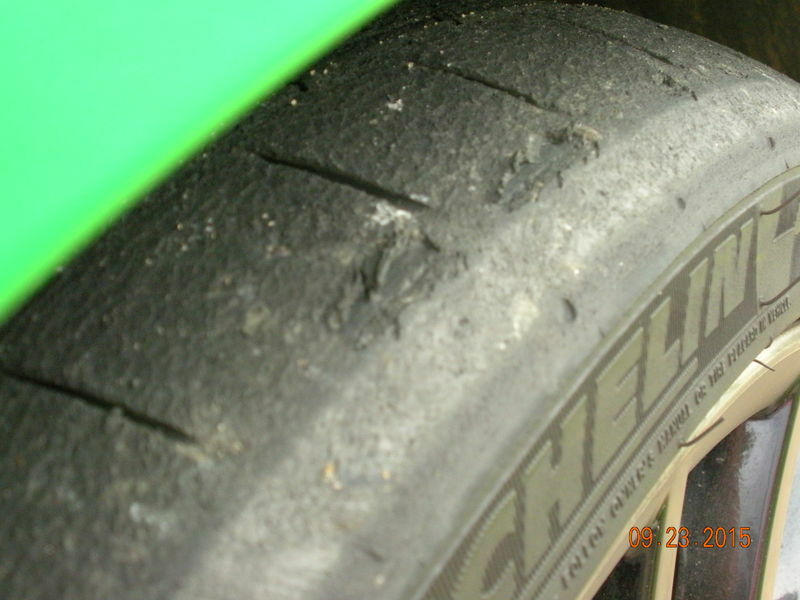 Another example of excessive tire wear from insufficient camber - outer edge of the tire down to the cord in ~250 miles.